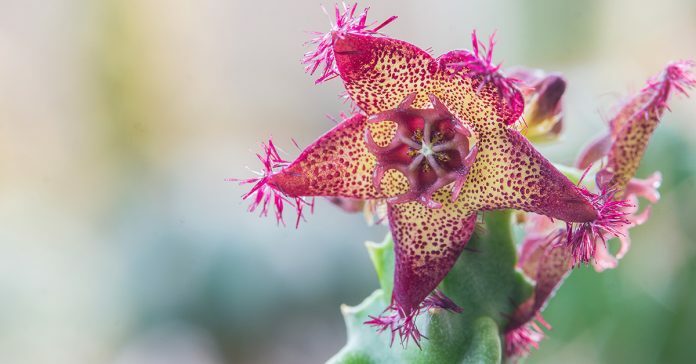 I know what you’re thinking: you probably can’t even pronounce Caralluma Fimbriata, much less know what it is and why it’s so important, but that’s why we’re here! This succulent native to India has many important uses especially when it comes to weight loss and appetite suppression. The rich history of Caralluma Fimbriata dates back hundreds, maybe even thousands of years, and is starting to make its mark in studies worldwide in recent years. Now that it’s gaining so much popularity, it’s important that users and potential users alike understand more about its overall effects and safety. Caralluma Fimbriata (pronounced kara-lume-ah fim-bree-ah-tah) is an edible plant found primarily in India, but also in other areas of the Middle East and Africa. Ancient Indian tribes used it to chew on in order to decrease appetite while out on a hunt, and also to help retain water to reduce risk of dehydration. The cactus blooms in the late summer producing brown, purple, tan, yellow, and red colors. It has recently been bottled and used as a supplement to help reduce appetite, build endurance, and increase weight loss results. The bottled extract is called C. Fimbriata and is commonly available at most pharmacy or holistic stores. Caralluma Fimbriata is a member of the large Apocynaceae family of plants. It was once used to draw property lines in Africa and India in lieu of fences. This fantastically beneficial plant stores water in its spine, which could be consumed by humans during droughts and times of famine. In India Caralluma is used for heart problems and diabetes in addition to weight loss and appetite suppression. These claims have not been studied widely, so India is currently the only place that utilizes Caralluma Fimbriata for these purposes. In Ancient India people used to eat Caralluma Fimbriata raw, despite it having an incredibly foul smell. In some cases Indian people would also boil it, but not add any additional flavors or ingredients. Still others cooked it as a vegetable and added spices or condiments to cover the flavor. A very common way to use Caralluma Fimbriata in India and across regions of the world where it is native is to add it to chutneys or pickles. In the United States it is not commonly cooked or utilized as a plant, but is instead consumed primarily in extract form or in a supplement. Caralluma Fimbriata is safe to eat according to the U.S. Food and Drug Administration. The recommended dosage of the extract in the US is 500 milligrams twice daily for up to sixty days at a time. The effect of this extract on the human body after sixty days has not been studied, and is unknown. Taking too much C. Fimbriata can cause stomach problems, so it is important that you limit your dosage to the recommended amount, and check the milligrams in your pills if that is the form in which you take it. As always, check with your doctor before starting to use this product to ensure it meshes with other medications. The main benefit and use of this succulent is focused on weight loss through appetite suppression. Although it is available as its own supplement, Caralluma Fimbriata is also an active ingredient in many weight loss supplements and shakes. The appetite suppressing effects of this plant have been noted for over 100 years now, and with the FDA’s approval, it has become a highly used alternative to many chemical weight loss products and appetite suppressants. In addition to the historical evidence, modern studies have also shown the effect of this plant. In a randomized, placebo controlled study done in 2015, overweight participants helped researchers to test the effectiveness and safety of Caralluma Fimbriata extract over a period of twelve weeks. The study resulted in no significant evidence that the non-placebo group experienced better results or more appetite suppression than the placebo group. However, it was noted that the extract was well tolerated among participants and negative effects were mild and did not last long. Another study, this one also randomized and placebo controlled, that was done in 2006 in India concluded that the placebo group did not experience significant weight loss or loss of inches, where the group taking C. Fimbriata experience statistically significant changes in all measured areas. Similar results were achieved in a 2004 study done in Los Angeles where 26 people participated and were able to lose at least six pounds over the duration of the study versus the placebo group that did not experience significant weight loss. Although more research needs to be done on this product on a larger scale, especially on medications that include Caralluma Fimbriata as an active ingredient along with other vitamins and minerals versus the extract alone, the results seem to conclude that this is a safe and at least mildly effective weight loss product. As we talked about briefly above, stomach pain, constipation, gas, and other gastrointestinal issues are occasional side effects of using C. Fimbriata even when used at the recommended dosage, so it’s important to consult your doctor before implementing this product as part of your daily diet plan. If you are pregnant or breast-feeding it is a good idea to avoid taking Caralluma Fimbriata since there have not been enough studies on its effects on infants. In addition, there is little to no information on how it interacts with over the counter medications or other supplements, so be careful when beginning to use it. Although more research needs to occur on Caralluma Fimbriata before we can really say whether or not it is an overall effective weight loss supplement, most studies show it having at least a mild effect on appetite suppression and weight loss in overweight adults. We will repeat that it is always important to speak with your doctor before starting a new supplement to ensure there will not be adverse interactions with any current medications or supplements that you are taking. In addition, pregnant and nursing mothers should avoid taking this supplement. The Food and Drug Administration has determined that Caralluma Fimbriata is a safe ingredient in medications and supplements as long as dosage instructions are followed and the product is used for no more than sixty days at a time. The effects of long-term use are not well studied, so use beyond sixty days should be avoided. Fimbriata appears to be most effective when combined with a healthy diet and mild exercise. Using it without physical activity has not been studied thoroughly, and it is never safe to be sedentary for extended periods, so ensure you get the best possible results by exercising at least lightly every day.